Provisioning your pup on a camping trip isn’t so different from provisioning for any other kind of road trip (see our road-trip tips on DogTrekker.com). Protection against ticks, fleas, heartworms and parasites is a must, as is a dog first-aid kit for away-from-home emergencies. Don’t forget pickup bags and/or a lightweight trowel to bury waste (check rules at your campground). • At most campsites, rules call for dogs to be leashed at all times and to sleep either in your tent or in your vehicle. Obviously, you can’t cook or build a campfire with a leash in your hand, so unless your pooch is a couch potato, you’ll want to think ahead about how to temporarily tether her so she won’t run into the road or take off after a squirrel while your back is turned. A leash around the leg of a picnic table will work, of course, but it will also keep your dog under foot. Cable tie-outs, widely available at pet stores, can be secured between two trees and will keep Daisy safe and happy while you putter around. An option popular with hunters, and especially handy at sites without trees, is a stake-out post with a 30-inch chain attached to a swivel. Bella can move freely within a five-foot circle, and you can position the stake almost anywhere (pack a mallet to hammer the post into the ground). Be forewarned: pet-store stake-outs that screw into the ground might work well in soft, grassy lawns, but can be difficult or impossible to twist into dirt at a campground. 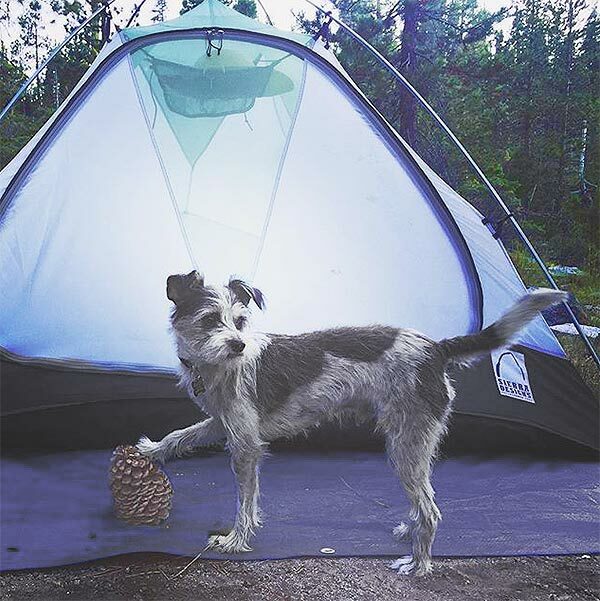 • Lola will have to sleep in your tent or in your vehicle, where she’ll be safe from wildlife and not tempted to bark the night away, disturbing other campers. A portable kennel is a lifesaver for dogs prone to nighttime pacing, wandering or responding vocally to unfamiliar sounds and smells. 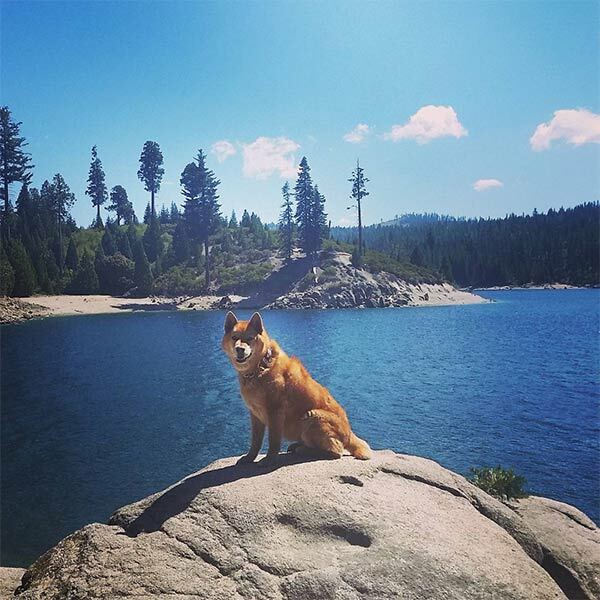 • California leash laws, revised in 2006, set out some rules for people leaving home with their pets, and individual RV parks and campgrounds may impose additional layers of regulations. A page at Camp-California.com spells out the leash-law basics.